Mirror photo by Shen Wu Tan / William Snyder III draws a portrait of Mari-Pat Beene at the Pigeon Hill Studios in Bedford on Wednesday. 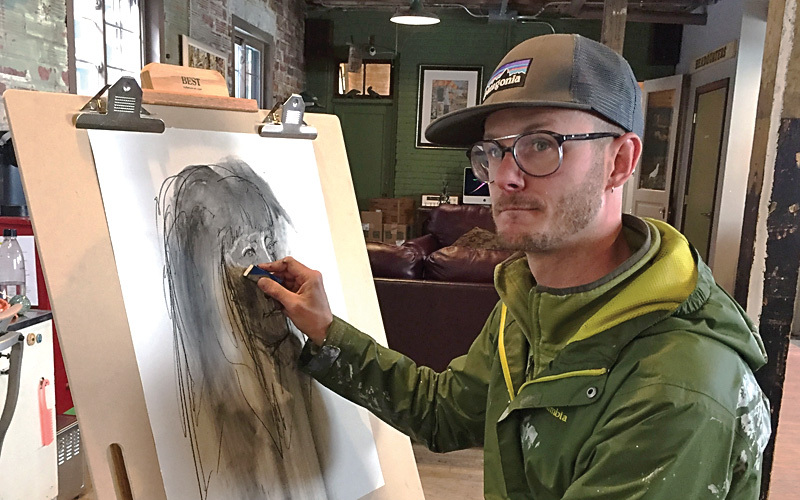 The local artist will be hosting weekly live portraiture sessions at The Clay Cup in Altoona on Mondays, W.C. Clarke’s Cheese Shoppe in State College on Wednesdays and the Pigeon Hill Studios in Bedford on Fridays. BEDFORD — A local artist tossed charcoal powder at a blank piece of paper clipped to a wooden easel before drawing the fine lines of his sitting portrait subject. Bedford native William Snyder III occasionally joked and laughed Wednesday with his subject, Mari-Pat Beene, in her studio, Pigeon Hill Studios, along South Juliana Street, as he sketched. One of those nuggets of history that Snyder focused on for a project was the 1994 genocide in Rwanda. The “800,000 Acknowledge. Remember. Renew.” project, named after the estimated number of deaths from the genocide, is an installation piece of crates, each filled with hand sewn books of pages dedicated to the victims of the historical event. There is a total of 800,000 pages, 2,500 books and 100 crates. The crates represent the number of days the genocide lasted, Snyder said. A collaborative effort, the project recruited the help of six high schools and three other groups to create the books for the installation. To recognize the 20th anniversary of the genocide, the United Nations displayed his project at its New York headquarters in 2014. According to the project’s website, 10 percent of the Rwandan population was killed in the genocide, and the country continues to struggle with poverty and personal loss. Also tying his personal experience into his art, Snyder said his Rwandan friend, Yohani Kayinamura, who opened up a home for street children in the east African country called the Umuryango Children’s Network, partially inspired the project. The commemorative project helped fund a water well in Rwanda. Through his artwork, Snyder said he hopes to “bring a spark of change” and to challenge people’s ways of thinking and perspectives. To give people a different perspective on suicide, Snyder installed 144 yellow balloons on the side of a parking deck in State College in 2016. Each balloon represented a suicide death in Pennsylvania for the month of September, also known as Suicide Prevention Month. The Save 144 project “called attention to the fragility of life, that once air is gone, the life is lost,” states Snyder’s website. It was later learned a suicide attempt was stopped the evening before the installation at the same parking deck on Fraser Street. When asked to describe himself as an artist, Snyder said he is unable to categorize himself due to his eclectic use of mediums. But he did note he enjoys creating art that uses vibrant colors, mixes craft and play, is somewhat historically motivated and provokes deep thoughts from his viewers. 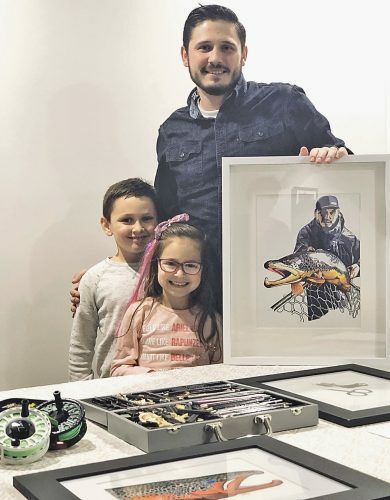 The 39-year-old artist is now in his second semester teaching drawing and foundations at Penn State University, where he received a bachelor’s degree in integrative arts and a Master of Fine Arts degree. Before receiving a bachelor’s degree, Snyder hopped from Carnegie Mellon University to Colorado State University to Allegany College of Maryland until wrapping up his undergraduate schooling at Penn State. He is a 1998 graduate of Bedford High School. But it was in elementary school when Snyder began taking art lessons. Art was infused at an early age for him, he said. Since leaving his day job as a business manager and graphic designer, Snyder said he has been reinventing his life as he tries to establish a career as an artist. April Ressler, Snyder’s older sister, gave credit to her brother for trying to make a career as an artist, noting his drive and motivation to pursue his passion full time. She added she is proud to see his work displayed in so many places. One of her favorite pieces is his mural at the I-99 underpass in Bedford that depicts local residents at the annual county fair. Central PA Festival of the Arts Executive Director Rick Bryant described Snyder as a creative, multi-talented professional artist who is the “real deal” and can work across a wide variety of platforms. Bryant, who has collaborated with Snyder on different projects, even recruited the artist to draw portraits of his family members, citing his ability to capture the spirit of the person he’s sketching. “He’s a guy with a family, putting meals on the table. And using his creative gifts, and he’s got those in spades, is how he chooses to do that and I’m glad he chooses to do it that way,” Bryant said of Snyder. Snyder is married to the former Julie Bistline and together they have three sons and a daughter. As Snyder glanced over his left shoulder at his portrait subject, he occasionally whistled to the background music softly playing in the studio. His right hand dragging dark charcoal along the white paper. Art to him, he said, isn’t just the tangible end product but is also the connection shared between the artist and the subject.